Ohio State's 42-35 Sugar Bowl win over Alabama assured that the SEC won't play in the College Football Playoff final and struck a blow into any perceived SEC supremacy. NEW ORLEANS – Some Alabama players jogged into the tunnel, scurrying away from a now too-familiar backdrop of failure in the Superdome. Some walked slowly, like center Ryan Kelly, who threw his head back and exhaled deeply on his way out. Daniel Geddes, a senior wide receiver, dropped to a knee and remained there for a few moments before popping up with reddened eyes. Low Tide, all of them. And as each and every left the Sugar Bowl turf they were greeted with one final indignity heaped upon the rest. From the stands above, Ohio State fans rained down a sardonic serenade: “S-E-C! S-E-C!” The mantra of college football’s power core was twisted into a punch line, from beat-your-chest to simply beat. If the west division of the league maintained a lofty perch entering bowl season, top-seeded Alabama’s 42-35 loss to the Buckeyes in a playoff semifinal on Thursday was the thud at the end of the fall, one last hard bounce off the bottom stair. It will be easy for the conference’s faithful to make a solid argument for its superiority. But they’ll find an audience more dazzled by SEC bleed. Seven SEC West teams played in the postseason. Two of them won. Three of them played in prominent New Year’s Six bowls or the playoff. All three lost. The purported advantages in athleticism or speed weren’t enough to overcome teams from Wisconsin, Indiana, Ohio and another one that runs the option. There is a fine and legitimate retort available, of course: The big, fat zero in the loss column for SEC West teams in non-conference play. Unfortunately the glare off the bowl trophies is making it hard for people to focus on that. If there is a shoots-under-the-fingernails aspect to Alabama’s loss, this is it: In a stuffy locker room with pads and braces and beef jerky chunks strewn about the floor, the Tide insisted preparation wasn’t the problem. They claimed absolutely nothing Ohio State did, especially on the offensive end, represented a swerve from what they had observed on film and prepared for in the walk-up to the Sugar Bowl. And Ohio State came up with 537 yards of total offense against a defense that had surrendered more than 200 fewer than that per game coming in. The Buckeyes rushed for 281 yards against a unit that entered the game as the nation’s No. 1 run defense, allowing 88.7 yards per outing. The Buckeyes’ defense, meanwhile, picked up three sacks and three interceptions, one of which was returned for a touchdown in arguably the game’s biggest play. “That’s the crazy thing about it -- we knew everything they were going to do coming into the game and they did what they did,” Alabama safety Nick Perry said. It could be that the Tide is not quite telling the whole truth and that the Buckeyes nudged them off-kilter with unfamiliar calls or schemes. That might be the preferable view for the SEC mythologists. Because if Ohio State truly didn’t surprise Alabama, if what the Tide got was what it saw, then that might just mean a Big Ten team has as many players with elite speed and strength and ability as the SEC’s resident leviathan. “There’s no difference between SEC athletes and Big Ten athletes,” Perry said, quite possibly earning a lifetime ban from all conference athletic venues, or at minimum its message boards. Here’s where we note that the Sugar Bowl was a thrilling game that came down to the final possession, and that Auburn and LSU losses to Wisconsin and Notre Dame, respectively, were similarly rollicking one-possession games at the very end. And that injuries and coaching departures meant Mississippi State and Ole Miss were not nearly the same teams in late December that at one point ranked No. 1 and No. 2 in the country months earlier. A few reversals of fate, and the “S-E-C!” catcalls are delivered by the very people that created them. Instead, they were a shiv from the opposition. And what do games like Thursday’s Sugar Bowl do, Perry was asked? “They make statements,” the Buckeyes junior said. They do, and they’re lasting in some ways and as ephemeral as ever in others. If there is an SEC team hoisting the national championship trophy in a year and a few days, no one will be surprised. The league won’t lose the ability to climb those stairs again and reclaim a spot at the top. But neither will any program soon forget what the end of 2014 and the first day of 2015 told us, that the mighty can fall, and often. With 93 seconds left in the game Thursday, Alabama took over possession, down just one score and 82 yards from the end zone. Players and staffers on the sideline dutifully held aloft four fingers on each hand, their defiant sign of belief that the final quarter of every game belongs to them. They had their own evidence of this, against LSU and Arkansas and Auburn this year. But this time, as the 90th second passed, one final heave to the end zone landed in the grasp of an Ohio State player. The game was over. 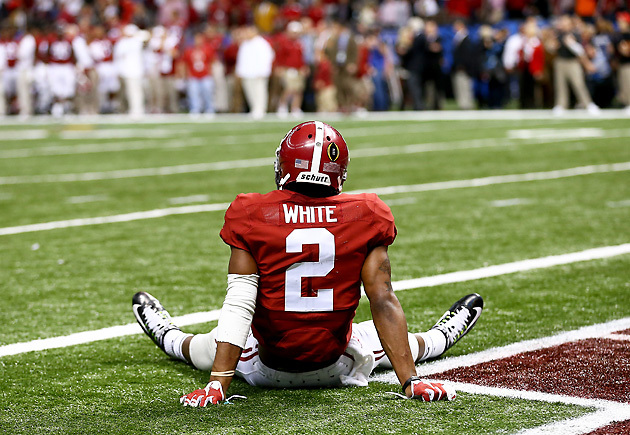 Alabama and the SEC walked out of the 2014 college football season without anything left to play for. The Tide tight end paused, and grinned just a bit. “I guess it means we’re mortal,” he said.